Alysha Clark cuts along the baseline around the Lynx’s Rebekkah Brunson. Photo by Neil Enns/Storm Photos. 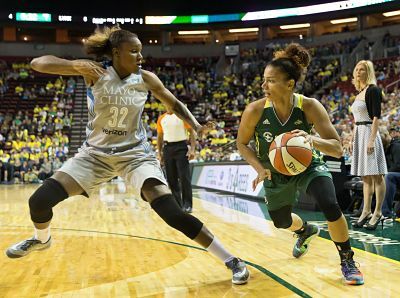 Seattle, Wash. – For three-plus quarters, the Seattle Storm kept pace with the defending WNBA champion Minnesota Lynx. But for every Storm run, Minnesota had an answer, and did just enough to spoil Seattle’s home opener with a 78-71 victory in front of a sellout crowd of 9,686 at Key Arena. 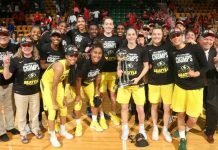 Alysha Clark finished with a game-high and career-high 20 points for Seattle, while rookie sensation Breanna Stewart notched her second double-double of the season with 14 points and 13 rebounds. 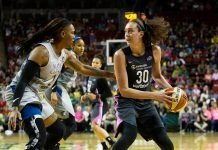 Minnesota – arguably the deepest team in the WNBA – had a balanced scoring approach with five players in double figures, led by Maya Moore’s 17 points and Sylvia Fowles’s 15, in a game where the Storm couldn’t grab the lead after a frantic-run late in the first quarter. After trailing by nine midway through the first, Seattle outscored Minnesota 14-0 over the final three and a half minutes to take a five-point lead. That margin would be the Storm’s largest advantage of the game. The Lynx used a 9-0 run of its own in the second quarter to pull ahead, and led 46-41 at the break. Both team went cold to start the second half, each with just two points in the first seven-and-a-half minutes of the third. Time and again, Seattle chipped away at the advantage, and trailed by just one with less than seven minutes to play at 60-59. But that’s as close as the Storm would get. Over the game’s closing moments, Jewell Loyd said, Minnesota was able to make the most of their size advantage on the boards. Storm coach Jenny Boucek, who received a technical foul with a just over a minute to play in the third, raised questions about the officiating after the game, particularly in what that meant in the post. In particular, Minnesota was able to shut down Stewart over the game’s final 20 minutes, as the top pick went 0-for-10 with zero points. When asked whether Stewart’s second half was a matter of ‘growing pains’ for a rookie, Boucek again alluded to Minnesota’s physical post play, and how the officials handled it. 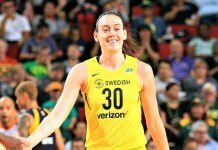 Seattle is back in action on Thursday against the 1-3 Mystics at Key Arena at 7 p.m.
Clark had just four points combined in her first two games, and no field goals, but had seven points in the first quarter en route to her game-high and career-high 20-point performance. Abby Bishop did not play for the second straight game, while Blake Dietrick and Jenna O’Hea were out for the third consecutive game to start the season. O’Hea was not with the team for the season-opener, and did not dress against Phoenix. Seattle shot just over 42 percent from the field, better than it did against Phoenix (40 percent), but well below its season-opener performance against Los Angeles (49 percent). Seattle is now 10-7 in home openers.